I was arrested for Oscar Alfaro. Oscar came to the U.S. to escape poverty and make enough money to support his family. Now, he fears being deported and separated from his wife and daughters. Last year, Oscar was served with a deportation order to leave the country. After receiving support from numerous elected officials and more than 30 letters of support from neighbors, friends and co-congregants about his good moral character, Oscar was issued a one-year stay of deportation. This solution is temporary, and leaves his family with the constant fear of receiving the final order. I was arrested for Angie Kim. Angie’s parents brought her to the U.S. when she was nine years old. Recently, she received deferred action under the Deferred Action for Young Arrivals program but she still fears for her parents, who are undocumented. I was arrested for Jennifer Martinez. Jennifer is a young mother of four from Manitowoc, WI and a U.S. citizen. Her husband was deported to Mexico over a year ago and now she works three jobs to provide for her family. I was arrested with more than two dozen other courageous activists in the immigrant rights, progressive, faith and labor movements including: Angelica Salas, Executive Director of the Coalition for Humane Immigrant Rights of Los Angeles; Eliseo Medina, Secretary-Treasurer of the Service Employees International Union; Arturo Rodriguez, President of the United Farm Workers, and; Arlene Holt-Baker, Executive Vice President of the AFL-CIO. We all were arrested because we need to send the strongest message possible to our leaders: No More! No Mas! Together, we kicked off “40 Days of Action and Prayer for Families.” This is a major cross movement escalation in the fight for immigrant families and a pathway to citizenship for all 11 million undocumented immigrants in the U.S.
We committed this act of civil disobedience because we need to send the strongest message possible to our leaders, that the current situation is so unjust and unsustainable that people are no longer willing to comply or be complicit in the injustices committed by our government. Contrary to what politicians would have you believe, immigration reform is not a political issue but a moral imperative. House GOP members, not only have failed to act on a pathway to citizenship, but have instead let the most conservative and anti-immigrant GOP members take the lead on the conversation. For example, the House Judiciary Committee earlier this year approved making it a federal crime for undocumented immigrants to be in the United States. More than 130 House Republicans voted against authorizing the Violence Against Women Act, which offered protections for immigrant women. And the House passed an amendment introduced by anti-immigrant GOP Rep. Steve King to deport DREAMers. These actions are a tragic affront to faith, family and American values and we have had enough. Our communities have marched and we have voted in record numbers, delivering a mandate to Congress to keep our families together. 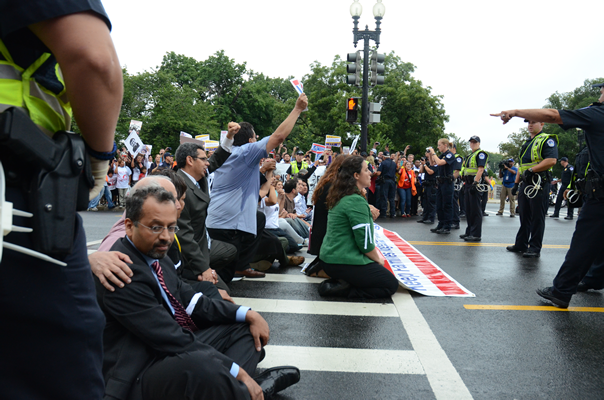 In blocking a way forward on a pathway to citizenship, Republicans are making a disastrous political mistake – but that is not why we are raising the stakes to civil disobedience. We turn to non-violent direct action because this is a moral crisis and America and Republicans need to understand how the broken immigration system is an ethical wrong visited on thousands of American families every month. Our organizations – immigrant rights, faith, progressive and labor – will not stop escalating until we win what is right for America. Our rapidly growing political power confronts Congress with the moral urgency and human cost of our broken immigration system that can only be ignored at the risk of unprecedented upheaval. America deserves a vote on immigration reform with a path to citizenship. Republicans have run out of excuses. The House GOP is what stands between 11 million immigrants and the American Dream. No more inaction on a bill. No more allowing your anti-immigrant members to dictate the conversation. No more tearing our families apart. No more fear for Oscar, Angie and Jennifer. We are willing to spend a bit of time in jail to send the message: No More! No Mas! Deepak Bhargava is the Executive Director of the Campaign for Community Change. The Voting Rights Act: Why Are We Regressing?